We are excited to announce that we have been appointed by the Westway Trust to work with the Westway communities to agree a vision for the future. We are committed to a collaborative process to explore issues and ideas to deliver improvements in the short, medium and long term. There are no pre-fixed ideas or outcomes. Projects might be social, economic, environmental and cultural and deliver community benefits. The only requirement is to work collectively and be inclusive and be aspirational whilst realistic about what can be delivered. An intensive period of engagement and listening through November and December 2018 and ongoing to hear the views of local stakeholders and the locals – talking to the community at drop-ins, community meetings and pop-up events on-street to find out more about who lives and works in the area, what people like and dislike about the Westway estate, and how things could be improved in the future. We would like to thank those who have participated so far and given their time and look forward to continued involvement. •	The ‘Westway’, or the A40 Motorway was built between 1964 and 1970. From its construction stemmed the destruction of a tightly-knit community in North Kensington, as well as the creation of a 23-acres of derelict land underneath it. •	After long years of struggle from local community, the Westway Trust was set up in 1971 as the custodian of the 23 acres-estate of land under the Westway Flyover, to promote positive uses of the space. •	Today the area is a diverse and vibrant place, with numerous grassroot organisations, a worldwide reputation of the arts, music and literature, Portobello Market and the Carnival. 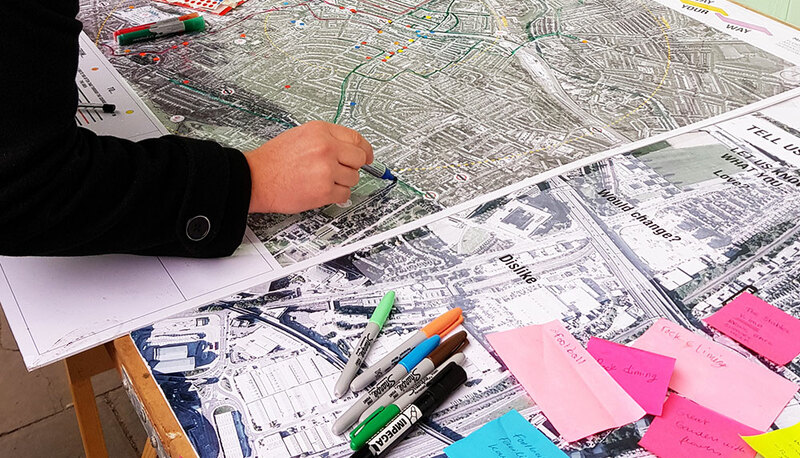 •	Last year the Westway Trust held a three-week engagement with local residents, businesses and community groups about the land under the Westway, exploring ways of improving it. •	The project is supported by the Mayor of London’s Good Growth Fund.